The first thing you’ll need to do is obtain the network traffic for the WPA-Enterprise MS-CHAPv2 handshake you’d like to crack. 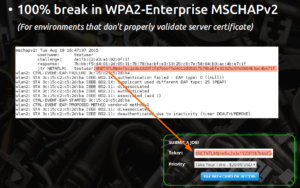 For WPA2 Enterprise wireless handshakes, simply use a tool like hostapd-wpe in order to obtain ‘challenge’ and ‘response’ parameters. There’s a number of great HOWTO’s out there on running hostapd-wpe like this one for Kali Linux. Then just submit the JtR NETNTLM hash to the form on the Get Cracking page.